This makes Chinese one of the most lucrative targets in the global economy – a fact recognised by governments across the world that are loosening visa policies, introducing extended visas, simplifying application processes, and cutting fees in order to compete for this highly lucrative market. Travel and hotspots long favoured by Chinese tourists, such as the United States (US), Japan, Australia, the UK, Canada, South Korea, Singapore, and Europe, have all recently made sweeping changes to their visa policies to make them even more attractive and accessible. Longer visa validities: Visas with ten-year validity – like those offered by the US2, Singapore3, Canada4, South Korea5, and Australia6 – have become much more common. 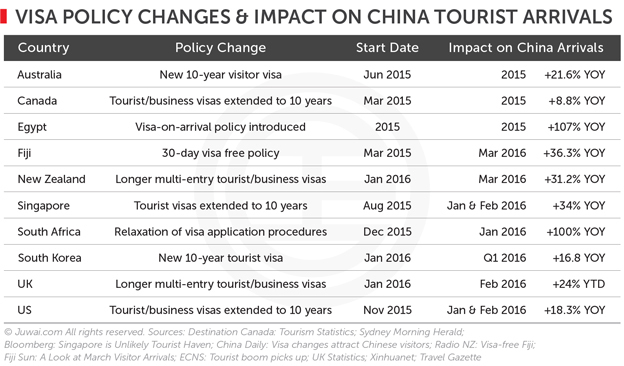 Typically with a 3-6 month maximum stay per visit, these visas reduce the hassle of repeated applications for Chinese travellers and offer long-term access. Simplified application processes: Online application processes and the removal of requirements for reams of supporting paperwork have made applying for visas much easier. Additionally, embassies from countries such as the UK7, Finland8 and Denmark9 are increasingly upping the ante by going to where the applicants are and opening up more visa centres across China to make ease and speed up visa applications for Chinese. Reduced fees: Governments have made it cheaper than ever before to get a visa. The UK, for example, has cut the cost of a two-year tourist visa from £324 to £85 to entice more tourists, and other countries have also reduced their fees to cut the cost of application. More importantly, these policy changes appear to be paying off. A prime example is Japan, whose government relaxed requirements for three-year multiple-entry visas and started offering five-year multiple-entry visas for high-income groups during early 201510 – China arrivals in Japan doubled to 5 million in 2015, compared to 2.1 million in 2014. However, the growing populace of Chinese tourists is an increasingly varied bunch with a widening range of locations filling up their bucket lists. As such, even countries not usually considered as standard tourist hotspots, such as Iran12 and Israel13, are also making their plays to catch a share of China’s outbound tourism market. Africa is also a case in point. Currently the fastest-growing port of arrival for Chinese tourists, Africa is seeing 80.9% annual growth in 2014, totalling an estimated 10.2 million trips.14 In fact, African nations, such as South Africa15, Egypt16, and Zimbabwe17, have all recently been falling over themselves to follow the lead of Mauritius’18 to offer visa-free entry. Asia – the most popular destination for outbound Chinese travellers, who numbered an estimated 98 million trips to the region in 201519 – just got even more accessible too. South Korea5, Malaysia20, New Zealand21, and Nepal22 have all announced new visa policies to boost their tourist industries. South America is making a play for China too. The 16,000-km trip from China just got a little easier to handle too – following Mexico, Peru, and Costa Rica who introduced similar visa policies in 2014, Ecuador23, Chile24, and Colombia25 have all introduced visa-free entry policies for Chinese tourists as well. Make no mistake, these policies are not just with tourism spending in mind. Investment from China’s increasingly outward-looking business sectors – which grew 51% y-o-y to 115 deals in Q1 2016 to be worth a total of $82.6 billion26 – and property investors figure prominently in the calculus behind looser visa policies. To an extent, countries around the world are taking their cue from Spain, Portugal, and other ‘Golden Visa‘ countries who went further than offering visa-free entries by loosening their visa policies in 2013 to offer residency in exchange for property and business investments. With such wide-ranging visa changes and increasing openness to business from China, governments are laying the foundations for what looks like continued growth in the coming years. Recent data from the US showed a 68% y-o-y increase in visas issued to Chinese tourists in Dec 2015 and January 2016 following the introduction of a 10-year visa shows that markets are already picking up. This is on top of the 68% surge that happened last year in Dec 2014 and January 2015. And looking across a wider range of countries, a clear pattern emerges – easier visa policies coincide with an increase in visitors. South Africa and Egypt have seen visitor numbers double at the start of 2016, and hotspots such as the UK and Singapore have seen 20%+ annual growth in tourist arrivals from China following their visa overhauls. Clearly, despite grand projections about the prospects and potential for outbound investment from China, such data compellingly shows that this market is growing and is already having a transformative effect on markets across the world. Beyond that, what’s also clear from our survey of recent government policy changes is that countries are increasingly looking to compete with each other for a share of this lucrative market. And if governments see the opportunity and are taking it seriously, then this clearly indicates that businesses – especially real estate – should too.